The Shadowknight profession is ideal for those who seek personal power through physical force and live to spread fear, hate, and despair. 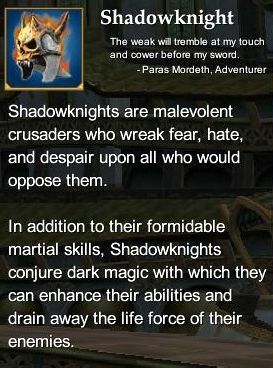 The Shadowknight is trained in martial skills and has the ability to conjure dark magic to enhance his abilities in combat. This combination of offensive and defensive capabilities makes the Shadowknight a very effective front-line combatant. This page last modified 2011-08-25 22:55:43.